There's nothing more mouth-watering than the steaming-hot, bite-sized Louisiana treat, but until his 2012 run, Bobby Jindal is just not coming back to DC, and would prefer that you stop emailing. Settle for some crawfathers instead, with Hot N Juicy Crawfish. From a Louisianan brother/sister team whose original location was featured on the Vegas episode of Man v. Food, Hot N Juicy boasts rustic, Southern fishhouse trimmings (nets, crab traps, a wooden ship's wheel), and utensil-less, wax-lined tables outfitted with rolls of paper towels and menus describing how best to attack the bugs, which include "twisting", "pinching", and "recruiting Casper Van Dien". 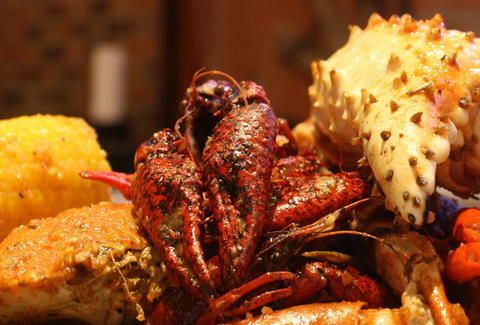 The eponymous critters're flown in daily from Louisiana and flavored with your choice of seasoning (from garlic butter, to family-secret recipes like "Juicy Cajun") and heat (mild to extra spicy), as are similarly crustaceany options like seasonal blue crabs and snow crab legs, all of which're laid out bare on the table and paid for by the pound, just like Hugh Grant's indiscretions. Mildly less dirty options include fried shrimp, catfish, and soft shell crab baskets (all served with Cajun fries), beers imported and domestic, and a specialty crawfish/veggies etoufee, a term from the French for "smothered" or "suffocated", just like some Hugh Grant indiscretions we don't even know about yet, and you know they were pricey. In true Louisiana style, they're celebrating this Friday and Saturday by giving away 1lb of shrimp per customer between 3-5pm (and a free pound with purchase afterward) -- suggest they're anything but generous, and even Bobby won't be able to deliver a response. Except perhaps to request again that you quit going through his trash.